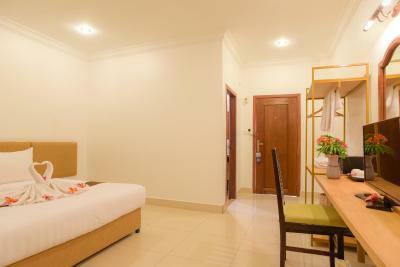 Lock in a great price for Po Residence Hotel – rated 9.2 by recent guests! 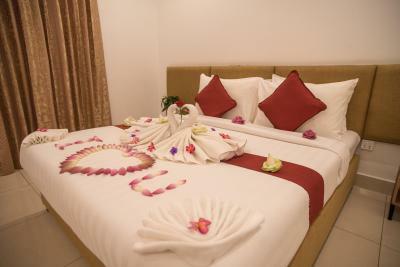 Lovely big room, very helpful staff, wonderful pool, good breakfast and other meals, very clean., good drivers. Excellent staff, very helpful and informed about Angkor Wat and other sights. Staff easily arranged drivers for sightseeing. Nice pool. Handy in-house restaurant with decent food. Nice lobby, good a/c, good room. 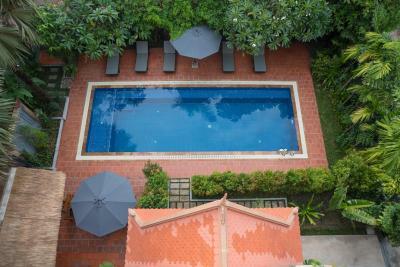 We stayed at Po Residence for nine days while exploring Angkor Wat and the surrounding countryside. 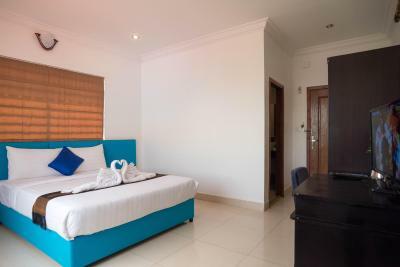 Our room was a Deluxe Double Room on the first floor overlooking the pool. 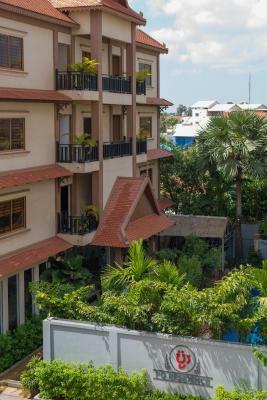 The hotel is very well managed (the manager speaks excellent English) and the staff are exceptional: friendly, attentive and they seem to really care about the guests. 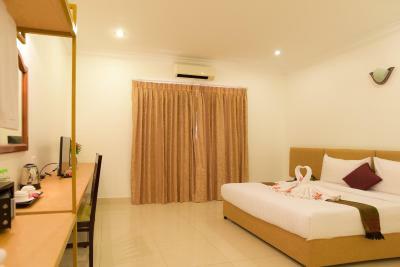 The large room has a big, comfortable bed and a workspace. Everything was clean, with the exception of the shower, which could use a good scrub around the corners. Excellent water pressure and plenty of hot water. Excellent wi fi connection and, although we lost power at times, the hotel generator kicked in immediately. The hotel is very quiet and the setting around the pool conducive to relaxing after a long hot day of sightseeing. 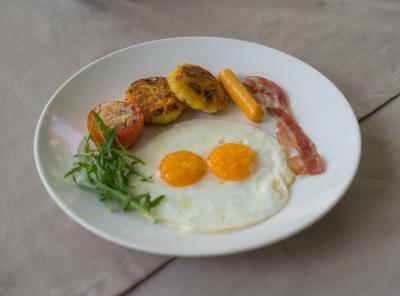 The included breakfast is exceptional with good coffee, fresh fruit, eggs, toast and beautifully presented. An excellent value for money. Highly recommended. We stayed in Room 105. Big room and bathroom. Absolutely clean. Very clean and modern swimming pool. Reception staff helpful all the time. 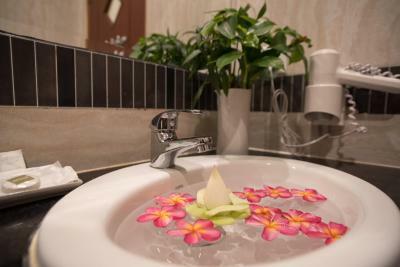 Very new facility or very good upkeep and maintenance. The restaurant and bar were decent. Great tuk tuk service to all points of interest. Nice pool, very good food and drinks, wonderful and very helpful staff. Great help for organizing trips with Tuktuk's at very good prices. Huge room, super clean. Cleaned every day. Friendliest staff. Great at arranging anything you need. Called cook in early so we could have hot breakfast before our flight. Pool facilities spotless. Very clean pool. Loaned us an umbrella. good value for the money and the staff was very nice. 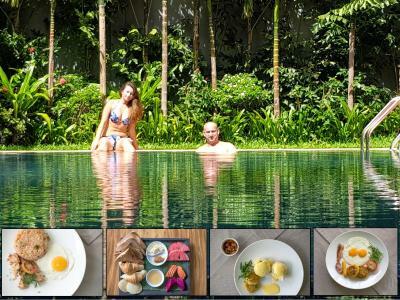 The pool was pleasant and the breakfast was just right. Extremely clean, this hotel is bran new. Beautiful private pool that has plenty of sun beds. Restaurant serves local and American food for amazing price - made fresh to serve. 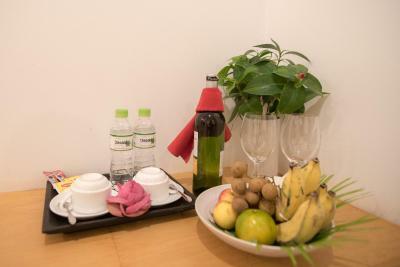 You receive fresh fruit everyday and free water. 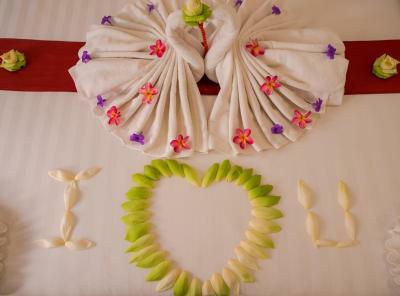 The staff treated my mother and I like queens, they helped us in every aspect such as travel plans fresh fruit plates when we had a sick day, free water and nuts everyday we sat by the pool. There is also an AMAZING free dinner and cultural dance that is near by and this food was so fresh and the dance was something we would have never experienced without this invite. The owner Mrs. Lee is an absolute angel, she taught us a lot about the local lifestyle and made sure everything was perfect everyday. 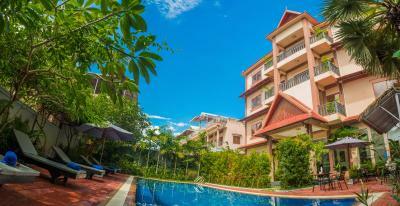 Located away from but not too far from busy town center. Accommodating staff. Easy going vibe. 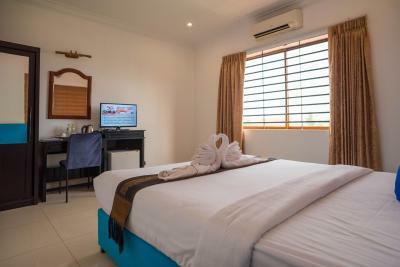 Po Residence Hotel This rating is a reflection of how the property compares to the industry standard when it comes to price, facilities and services available. It's based on a self-evaluation by the property. Use this rating to help choose your stay! 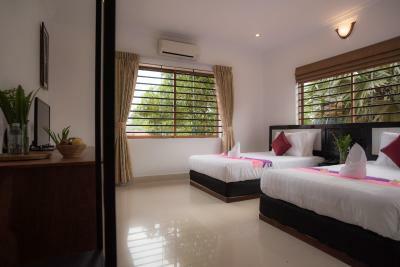 A 10-minute walk from Phsar Leu Thom Thmey (Upper Market), Po Residence offers 36 rooms with an outdoor swimming pool and views of Siem Reap City and Krom Mountain. 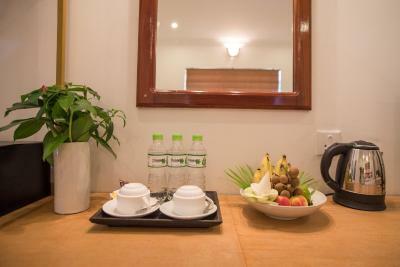 Daily breakfast and free WiFi access in public areas are offered at the property. 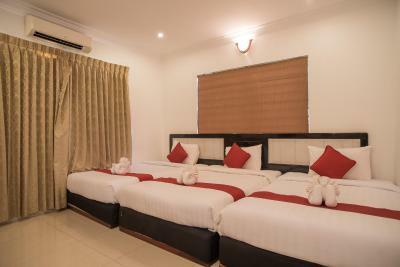 Po Residence is 5.9 mi from Siem Reap International Airport and an airport shuttle service is available. 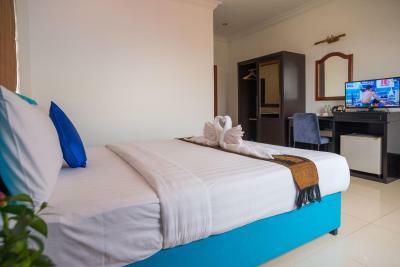 The hotel is a 30-minute drive from Krom Mountain and just 4.3 mi from the famous Angkor Wat, a UNESCO World Heritage Site. 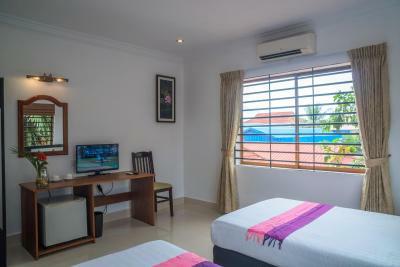 Fitted with a stylish Khmer decor and tiled flooring, air-conditioned rooms offer cable TV and a fridge. 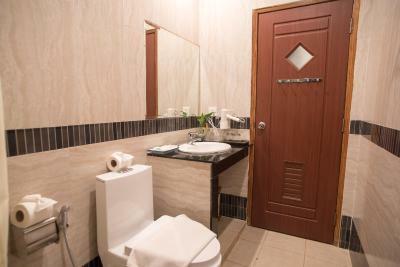 A private bathroom with bathrobes and slippers are provided. Room service is available. Guests can make travel arrangements at the tour desk. After a day of sightseeing, they can request for a relaxing massage. 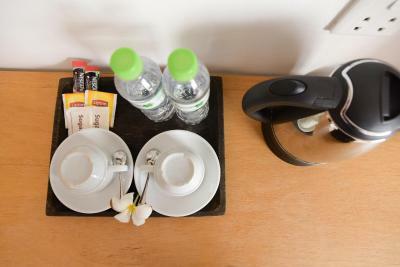 The 24-hour front desk can assist with luggage storage or fax/photocopying services. On-site parking is free. 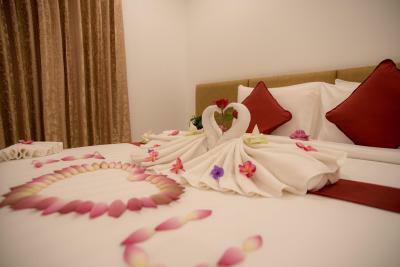 When would you like to stay at Po Residence Hotel? 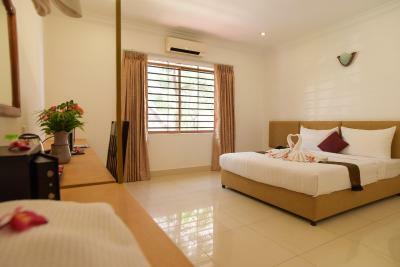 Fitted with tiled flooring, this air-conditioned room offers cable TV and a fridge. 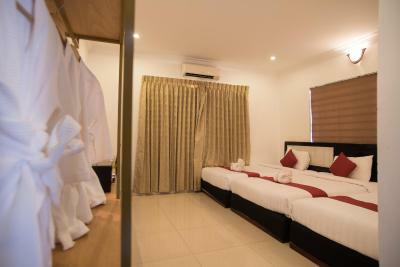 A private bathroom with bathrobes and slippers are provided. 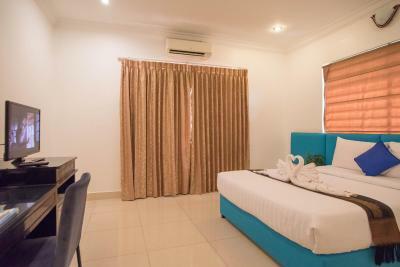 Larger room offers 2 single beds. 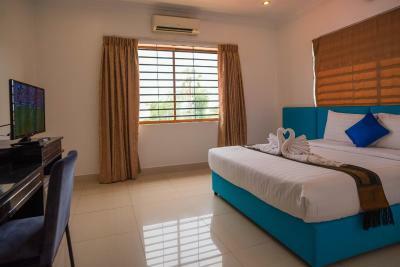 Fitted with tiled flooring, this air-conditioned room offers cable TV and a fridge. 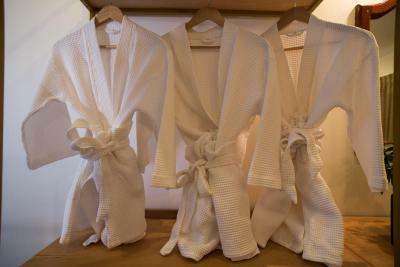 A private bathroom with bathrobes and slippers are provided. 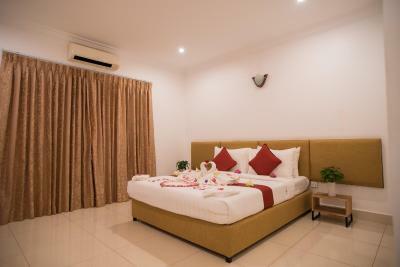 Room offers a double bed. 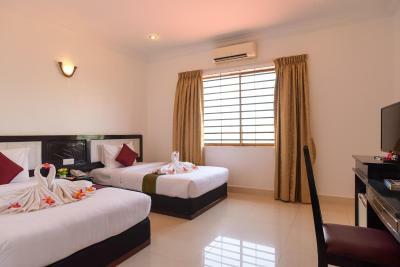 This twin/double room features a tile/marble floor, bathrobe and air conditioning. 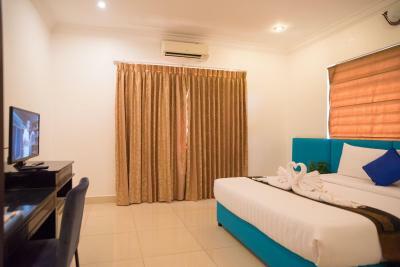 This room offers either 2 single beds or 1 extra large double bed. -Free one way pickup from airport or bus station by Tuk Tuk only (Arrival details are required at least 01 before arrival). 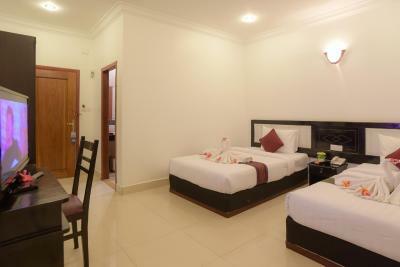 This twin room has a mini-bar, dining area and tile/marble floor. This family room has air conditioning, flat-screen TV and mini-bar. House Rules Po Residence Hotel takes special requests – add in the next step! 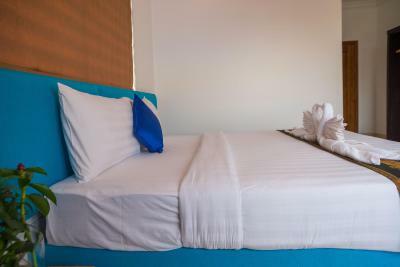 One child under 12 years is charged USD 8 per night when using existing beds. Po Residence Hotel accepts these cards and reserves the right to temporarily hold an amount prior to arrival. -Free one way pickup from airport or bus station by Tuk Tuk only (Arrival details are required at least one before arrival). Please inform Po Residence Hotel of your expected arrival time in advance. You can use the Special Requests box when booking, or contact the property directly using the contact details in your confirmation. This property might host on-site functions, so noise may be audible in some rooms. 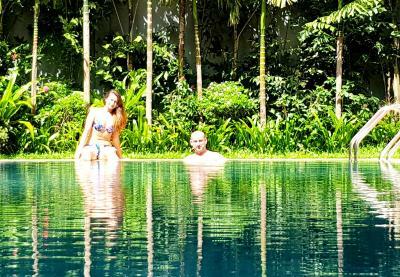 Swimmingpool was nice, breakfast the first day was very good (second day breakfast was awful) Very clean. The other staff members were not as nice as Baty, no milk or coffee mate in the rooms, no lift. Noisy for a light sleeper, because of the doors banging open and closed. I liked Baty who was the nicest staff member there. I liked the swimming pool and look of the hotel, breakfast was nice but needs a better selection. 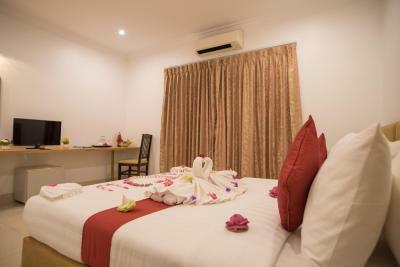 Very professional and friendly staff, massage was superb, rooms are clean and comfy. The breakfast offering was poor. The international offerings were not good and missed advertised ingredients like baked beans. The Asian food was better but portions were small. Serving staff were not confident and if items were not available they were unsure how to communicate this, or suggest alternatives. The reception staff were wonderful. Very kind and friendly people who did everything to help. 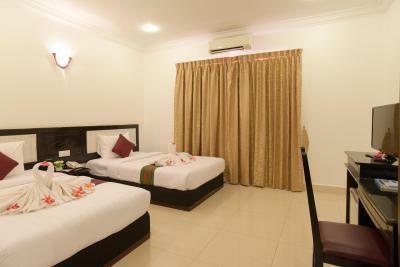 The rooms were of a good size and well equipped. The pool area was nice. Friendly staff who helped us every time we asked. The French toast, the helpful staff and the comfortable room. Staff was always available but we received info about tours that were not always helpful. We had some problems of communication, but by email they replied fast. Food and laundry service was quite expensive. 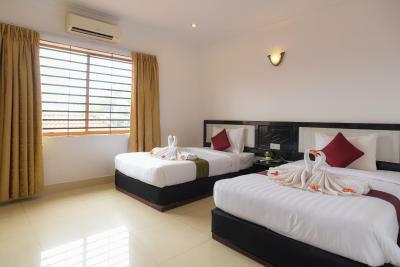 Room was large and clean, swimming pool was nice and absolutely useful after the visit to temples. Nice place and good location. I like the services provided, friendly staff, the ambiance and Monny, the tuktuk driver assigned to us who is very courteous. You have to stay here may be a bit out of town but if you’ve a scooter it’s only a few minutes to pub street. This was amazing value for money for us it was absolute luxury and the pool was an added bonus. Staff were fantastic and nothing was too much trouble for them. Room was fantastic and so comfortable seriously you would pay way much for a place like this at another hotel it was so good. Please stay here it awesome best place we’ve stayed in Asia so far. the recepcioniosty Baty was extremly gentle!! The befroom for extra shower when you are checked out. It was very very dirty. Amazing staff. Amazing hotel. Amazing facilities. Unfortunately during our stay we were involved in a tuktuk accident on the road, and one of us ended up breaking our elbow. One of the managers from Po Residence - Baty went above and beyond looked after us. He took us to hospital, waited for many hours whilst we were accessed after the accident, took us the following day back to hospital - even dropped us off at our next accommodation, all in his own car. He was incredible and probably our highlight of our stay. The breakfast here is delicious, the girls behind desk lovely, the room beautiful. 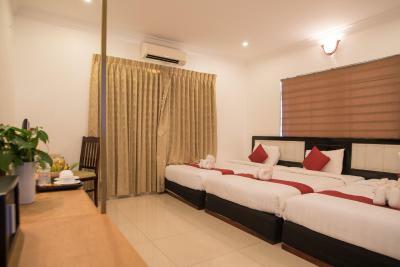 This is the place to come if you come to the beautiful Siem Reap.